Have you heard the News of the World? Is hacking into someone's phone to illicitly gather personal information for publication ever justified? Or did News of the World really just believe that they could get away with it? 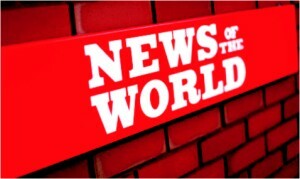 News of the World (NotW) is a British tabloid paper that has existed for over 160 years. This Sunday it published its last ever issue. Its investors have abandoned it; its advertisers have dropped it. Rupert Murdoch, its owner and well-known media mogul, has decided this hacking scandal has been too harmful for NotW's reputation and that it is better to cut his losses and sever it from his News Corp. organisation. So what exactly did NotW do? What they're being held guilty for is that they've hired private investigators to illegally hack into the phones of the victims of the 7/7 bombings, and many others. According to Scotland Yard, so many that the number of victims is thought to be around four thousand. One really has to wonder what kind of information they could gather from the bereaved relatives of the victims of a terrorist attack. What kind of scoop did they hope to find there? And the irony of it is, that somewhere in the NotW office is an award for their investigative work into the cricket match fixing in 2010 that ultimately led to the suspension of three Pakistani players. Not only had they hacked and tampered with the personal information of deceased and mourning victims, they also managed to destroy evidence of a murder case. Milly Dowler was kidnapped in March 2002 at the age of 13 and murdered at an unknown time between then and September 2002 when her body was discovered. The Guardian newspaper in July 2011 reported that Scotland Yard had discovered that her voicemail had been tampered with and it was traced back to Glenn Mulcaire, a private investigator working for NotW. Not only was this a blatant breach of journalistic ethics, it destroyed potential evidence in the court trial of the murder. This is not the first time NotW has been caught hacking though. Until now, it had only been celebrities and sports figures that had been targeted. In 2006, it was found that NotW reporters had been hacking the phones of Prince William. In addition to the hacking, NotW has also been accused of paying the British police to obtain stories, which is of course illegal and is now being looked into by Scotland Yard. This scandal has now escalated to the giddy heights of the British Prime Minister David Cameron. David Cameron's communications director was a man named Andy Coulson. Andy Coulson was the former editor of NotW and he was the editor when all the suspected hacking actions took place. This of course does not look good for Mr. Cameron and already there are calls for his resignation due to his “appalling error of judgment” in hiring Mr. Coulson. In connection “with allegations of corruption and phone hacking,” Mr. Coulson was arrested on 8 July and released on bail the same day. Another key figure in the drama is former editor and current chief executive of News International (the parent company of NotW), Rebekah Brooks who was the editor in 2002 when NotW hacked the phone of murdered schoolgirl, Milly Dowler. Calls for her resignation came from not only the general public but from several Members of the British House of Commons and even from opposition leader, Ed Miliband who said she should “consider her position” after the Milly Dowler allegations. She is also accused of repeatedly withholding evidence from the cross party media committee although she denies any knowledge of the hackings. She has though refused to step down from News International because of, what founder of The Independent, Andreas Whittam Smith calls, “[a symptom] of the self-serving, conceited thesis that 'only I, who was at the helm during the disaster, can steer us to safety'”. Tabloid journalism is often bashed and called frivolous. Actor Steve Coogan said it is not journalism. It does not expose corruption, nor bring down establishments which are inherently corrupt; all it is after is which celebrity is getting on with whom. But it is not as if NotW is going away for good. A successor, the imaginatively named “The Sun on Sunday”, is already being reported. While 200 or so employees are to be laid off after the closure of NotW on Sunday contributing to Britain's unemployment statistic, it has cleared the way for Rupert Murdoch to move on with acquiring yet another media asset Sky News. Some may say this was the ulterior motive for shutting down NotW so abruptly. In an almost fantastical turn of events and a fall from grace, protests against David Cameron and his errors of judgment are being staged everyday. There are also talks of new regulations which some argue will act against freedom of the press. The saga of the Brooks-Murdoch-Coulson triumvirate is not over yet. Whatever happens now, it's certainly a scandal worthy of The News of the World's pages. Have you ever thought that the teacher up there was so utterly boring and uninspiring that there HAD to be a better way to learn? Well there is! If you thought that e-learning was only for the developed countries, then you're wrong. Champs21 brings you Bangladesh's first e-learning website with games, quizzes and even jokes to keep you awake during those revision sessions. On their website, you can have access to much more than just your school curriculum. There are brain-teasers, trivia, and even a section where you can get your weirdest science-related questions answered by Newton himself! You also have the chance to see if you're REALLY ready to face that monster math test next week- all in the comfort of your home. If you're not, well, no worries, because Champs21 gives you detailed answers to all the questions on the website so that when you go into battle, you're armed to the teeth with all the knowledge you'll possibly need. Champs21 has not only tried to bring quality education to Bangladesh, but they've also tried to add some extra zing to it. “Young people love competition, so we've tried to integrate that into the site. Through our 'Champs League', we award the highest achievers on the site with attractive prizes.” Besides the goodies, there are plenty of reasons to keep coming back here. There are comic strips, exam tips and so much more. “E-learning helps a student to learn at their own pace. They can test themselves whenever they feel ready, and can also repeat lessons whenever required.” This helps a student gain a better understanding of the subject being taught. So if you think that those scribblings on your textbook are starting to look like Egyptian hieroglyphics, just log on to Champs21 to help you decode them. We guarantee that you'll find your answer. And with plenty of exciting new features on the way, we can tell that it's only going to get better.